Saturday, July 8th, 2006. Studio City, California. 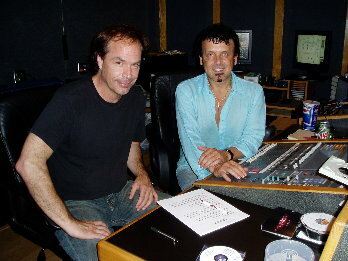 I'm here recording tracks for the new album, "Bridge of No Return" with producer David Longoria (U2, Sting, Aretha, Train). http://www.deloromusic.com/ I look out the window of this Universal City hotel at the blue pool below me, the precariously placed mansions dotting the hillsides around me, the hazy, blue skies - like a Hollywood diffusion-filter that smooths out the rough edges, and makes everything look faaaaabulous. Having lived just a few blocks from here some years ago, I'm reminded of how some things never change. The bustle on the streets below - everyone scrambling to get to where they're going - whether it's fame and fortune, or breakfast with an old friend. I hope that by making this album, at the very least, I can send the message that "hey, we hear you, you're not alone." Well, it's off to the studio for today. Feel free to chime in and say hello!